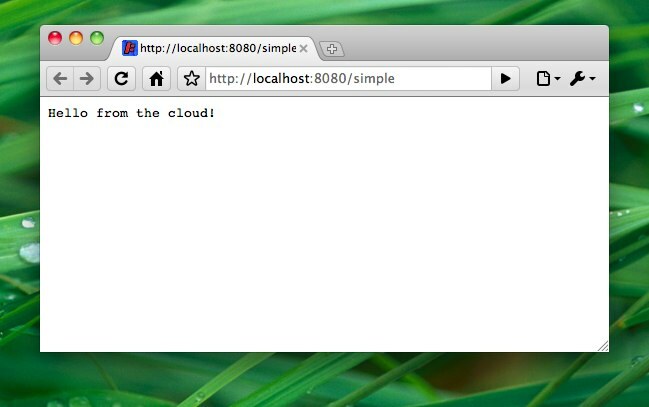 In this post, I'll show you how to create a simple OSGI-based servlet. Later, we will deploy this servlet to an Amazon EC 2 instance - this should be fun! Create a new plug-in project, naming it simple.servlet. Make sure to select Equinox as the target OSGI framework on the first page of the wizard. Also make sure you've got an activator (that option is on by default). In order for the servlet to be accessible via HTTP, we need to register it. If you have done some JEE/J2EE development, you know that servlets are registered using the web.xml servlet descriptor. As we're not in the JEE world any longer, we can't go down this road. Instead, we will register the servlet using a org.osgi.util.tracker.ServiceTracker. It's a little bit more code to write, but let me tell you: it's worth it as you'll see very soon. You can now start the server by executing the launch config. After a very short time, the text Registering servlet at /simple should appear in the console window, indicating your OSGi-based server and your servlet have been started up (a lot faster that it would have taken on Tomcat or any other JEE server, for that matter). Congratulations, you've just built your first OSGi-enabled servlet. In the next post, I'll show you how to deploy this servlet in an Amazon EC2 instance. You can download the source code for this post from my SVN repository on Google code.